Specifically, WFD. When I click on the thread there are many unread comments. But no notification. You mean the blue number counter? or emailing notification? Number counter and highlighted lines when you touch your profile icon (I’m on an iPhone so mobile version). Works sometimes, not other times. Thanks. Can you check the WFD thread, the tracking (with blue dot) is on. 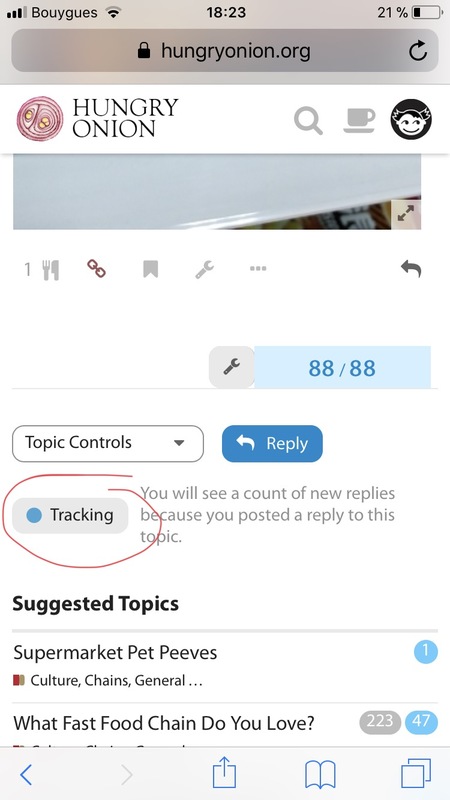 It is situated below the topic controls (next to the blue reply button). Yes, I checked that first, before posting. Wasn’t having the problem before yesterday. In this case, maybe a server problem. I’m on iPhone too, didn’t see this problem. Is there any known issues with Discourse and iOS? I am not really sure what causes this. is this a persistent or an occasional issue? I’m now having this problem starting today - on a thread I created and one I’ve participated on. I’m used to clicking through the blue numbers to work my way through posts on threads I’m interested in. Both threads are set at “Watching”. So there’s a glitch in the system somewhere. Same here, since the last update today, notification doesn’t work most of the time. When people reply or quote me, I don’t get notified. I stopped getting notifications also, since the upgrade. Even though I’m watching the new WFD thread I am not getting any notifications for new posts, only if someone likes a post I made. Can an admin look into this? That’s exactly what I’m getting this morning, @naf. I had likes on my dinner post last night on the WFD thread, but that’s the ONLY blue number I got on my avatar icon. There were three unread posts that I had to click on the “unread” link at the bottom of the WFD thread to be able to read those threads - including this one. Most likely because the server has been working hard to run through a process in the background after the software update. I can reboot the server tonight to see if it gets better. We have backups in our ‘process queue’. That’s probably where all the notifications are sitting waiting to be processed. I can reboot the server tonight to see if it gets better. The notification problems still persist this morning. It seems like the reboot helped free up some of the older notifications from the process queue. Little by little I am getting older notifications from 3 or 4 days ago. Hopefully it will catch up to the present day notifications soon once the reboot is completed. Ditto on this - I had several notifications for older posts (ones I’d already read but there were a couple of new posts as well). The new threads I’ve participated in are still not showing in notifications, but do show up as one of the “unreads” when I click on that link. So slowly but surely - thanks @sck! Here too, finally getting some old notifications of 3 days. My notifications are coming in, too; thanks @sck! Interestingly, this is the ONLY thread I’m not getting notifications for. I have to check the “unread” link at the bottom of any other thread to see if there are any unread.